Whoopi Goldberg wanted to return as Deloris Van Cartier in Sister Act 3. But Disney has different designs for this upcoming continuation of the franchise. They want a straight up remake. In a recent interview, Whoopi expressed her disappointment. 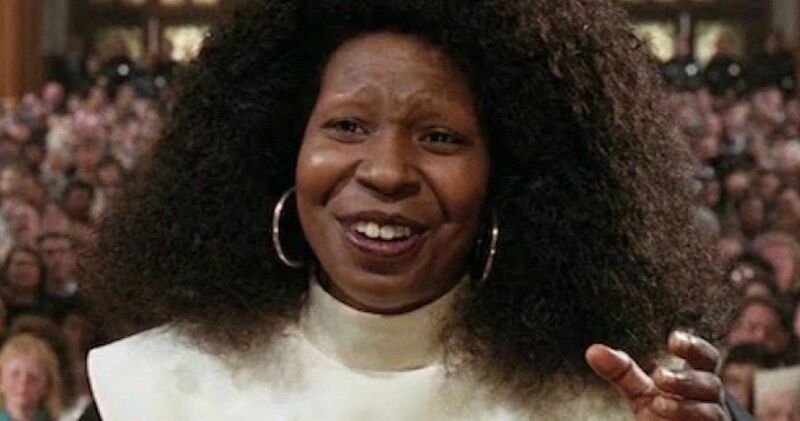 Though Whoopi Goldberg has a ton of iconic roles under her nun’s habit, the character of Deloris Van Cartier is perhaps the most beloved of the bunch, aside from those deranged lunatics who love dinophobe detective Katie Coltrane in Theodore Rex. Fans have wanted to see Sister Act 3 for years. A new movie is being developed, and has been churning at Disney since 2015. But this won’t continue the saga that ended in Sister Act 2: Back in the Habit, which debuted in theaters way back in 1993. Yes, it’s hard to believe that it’s been 25 years since the last Sister Act movie. As it turns out, despite her trying, it sounds like Goldberg won’t be involved too much in this next incarnation, whatever it turns out to be. Sister Act 3 will follow an all-new Nun, and it’s not quite clear if these events will happen in the same universe that Deloris occupies, or if she’ll be pulling a Ghostbusters move with a cameo that has nothing to do with the first two movies. Who knows who will lead the new movie. The casting potential is limitless, yet, no one will be able to recapture that Goldberg charm quite like the woman herself. Whoopi let it be known that Disney was planning a straight up remake of Sister Act on Good Morning Britain. It will be interesting to see where this reboot of the franchise goes. Will it be more of a musical like the extremely popular stage play based on the movie? Perhaps that’s one way to go about it. The original Sister Act had quite an ensemble, most of whom are still working today. It’s too bad that none of them will return, depraving fans of a Maggie Smith, Kathy Najimy, Whoopi Goldberg reunion. You can watch the interview where Whoopi drops new details on Disney’s ultimate plans for the continuation of Sister Act. She doesn’t sound very happy about how this is turning out, but maybe fans will show their support on social media, and the studio will listen. It’s happened before and it could happen again.